Learn about Nate’s comfort zones – from his favorite academic subject to his shoes and pregame meal of choice. 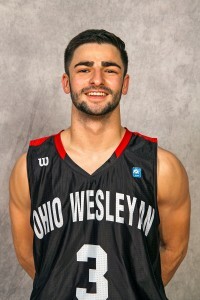 Ohio Wesleyan University senior Nate Axelrod (Dublin/Coffman) will receive the Jostens Trophy as the nation’s most outstanding NCAA Division III men’s basketball player, it was announced today by the Rotary Club of Salem, Va., which sponsors the award. Axelrod is the first Ohio Wesleyan player to receive the Jostens Trophy. The Jostens Trophy recognizes the outstanding NCAA Division III men’s and women’s basketball players who excel on the court, in the classroom, and in the community. The trophy will be presented on Thursday, March 15, in Salem, Va., in association with the NCAA Division III men’s basketball championship semifinals and finals. Axelrod, a finance economics major and Phi Beta Kappa inductee, was named North Coast Athletic Conference Player of the Year for the third year in a row, making him the first men’s basketball player in conference history to be so honored. He was a first-team All-NCAC selection for the fourth straight season, only the third men’s basketball player in conference history to accomplish that feat. He was named NCAC Newcomer of the Year in 2015. Axelrod ranks fifth in NCAA Division III in assists (6.8/game). He led the NCAC in scoring (19.2 points/game) and assists, becoming the first player in conference history to lead the league in scoring and assists in a season. Axelrod also ranks second in the league in free throw percentage (.857), is tied for ninth in steals (1.2/game), and is 14th in 3-point field goals (1.9/game). He finished his career as the second Ohio Wesleyan men’s basketball player and the fourth in NCAC history to surpass the 2000-point mark, and is Ohio Wesleyan’s all-time leader in assists (655) and consecutive games started (114). Axelrod is a 2-time All-America selection. 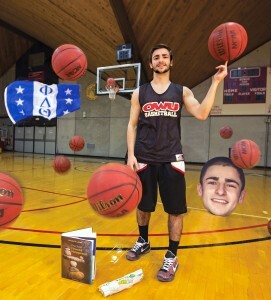 A finance economics major, he repeated as an Academic All-District® selection this year. Axelrod was an Academic All-America® choice in 2017. Off the court, he is active with Big Brothers/Big Sisters as well as in service to the Delaware community through his fraternity, Phi Delta Theta. “Nate is an incredibly deserving recipient of the Jostens Award,” said Ohio Wesleyan head coach Mike DeWitt. “He has excelled on the court, in the classroom, and in the community from the time he set foot on campus his freshman year. “Nate is a role model for every student-athlete that walks on campus,” said Ohio Wesleyan athletics director Doug Zipp. The Jostens Trophy is a national award created by the Rotary Club of Salem to honor the most outstanding men’s and women’s NCAA Division III basketball players of the year. The award takes into account three vital parts: basketball ability, academic prowess, and community service. The trophy models the Rotary International motto of “Service Above Self” by recognizing those who truly fit the ideal of the well-rounded NCAA Division III student-athlete. This season marks the 21st presentation of the awards, with the inaugural trophies bestowed in 1998. The Rotary Club of Salem is responsible for the initial review of nominations and narrowed the collection of candidates to 10 finalists over a 2-week span. The Club’s Jostens Trophy Committee employs a numerical rating system in determining the lists of finalists, ensuring an objective process through the first round of vetting. A selection committee of 30 or more individuals from various associations with Division III men’s and women’s basketball voted from among the 10 finalists.